A robot designed by scientists at the University of the West of England will generate its own power by eating flies attracted to its human waste cargo. 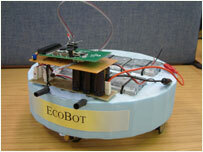 EcoBot II digests the flies in eight special fuel cells. The point behind the experiment is to create "release and forget" roving droids that are almost completely autonomous. So far it takes 12 minutes to make enough energy to take a step forward and radio its position back to base. The Bristol robotics experts in the Intelligent Autonomous Systems (IAS) lab are currently manually feeding EcoBot II with dead bluebottles. They are working on the next step, to make the 1kg droid predatory, using the sewage as bait to catch the flies. Professor Chris Melhuish said: "In the future we will require autonomous robots to carry out work which we don't want to do which is boring, difficult or repetitive, in locations we don't want to be in at a time we can't be there. 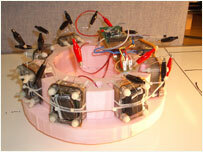 "This means that some robots will need to be able to extract their energy from the environment, that is be autonomous. ''This work takes us a few (small) steps in that direction." Energy is generated when bacteria in the sewage eats the soft tissues of flies, releasing enzymes that break down the insects' exoskeleton. Sugar molecules released from the insects' shells are then absorbed and used as energy by the bacteria. EcoBot II has a top speed of four inches (10 cm) per hour but it is energy efficient, travelling around for five days on eight fat flies, one in each fuel cell.